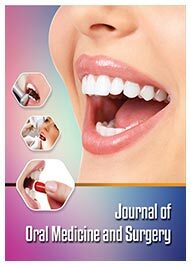 Journal of Oral Medicine and Surgery (JOMS), is a peer reviewed journal which is dedicated to advancing the science and practice of Oral Medicine and Surgery through the rapid publication of high-quality original research, systematic reviews, meta-analyses and technology reports, perspectives on all disciplines and therapeutic areas within the specialty. The journal is directed to medicine and dental specialists who involved in research and practice of Oral Medicine and Surgery. It features original research, review articles, clinical cases, perspective, commentary and others articles related to Oral Medicine and Surgery including the diagnosis and management of medical conditions that affect the oral and maxillofacial region. The mission of Journal of Oral Medicine and Surgery is to provide readers with a broad spectrum of themes in lichen planus, Behçet's disease and pemphigus vulgaris. Moreover, it involves the diagnosis and follow-up of pre-malignant lesions of the oral cavity, such as leukoplakias or erythroplakias and of chronic and acute pain conditions such as paroxysmal neuralgias, continuous neuralgias, myofascial pain, atypical facial pain, autonomic cephalalgias, headaches and migraines. The principal criterion for publication is potential impact on patient care. Journal of Oral Medicine and Surgery (JOMS) is an open access journal designed for the wide dissemination of research in this field to worldwide audience. New developments in methodology and techniques are important resources for the research community. With an emphasis on conceptual breakthroughs, its goal is to facilitate rapid publication and circulation of novel discoveries in the field of Oral Surgery, Oral Medicine, Oral Pathology, Oral Radiology, Oral Toxicology and advanced general practice dentistry. The journal scope encompasses the knowledge in medical research of the lichen planus, Behçet's disease and pemphigus vulgaris. Moreover, it involves the diagnosis and follow-up of pre-malignant lesions of the oral cavity, such as leukoplakias or erythroplakias and of chronic and acute pain conditions such as paroxysmal neuralgias, continuous neuralgias, myofascial pain, atypical facial pain, autonomic cephalalgias, headaches and migraines. Another aspect of the field is managing the dental and oral condition of medically compromised patients such as cancer patients suffering from related oral mucositis, bisphosphonate-related osteonecrosis of the jaws or oral pathology related to radiation therapy. Additionally, it is involved in the diagnosis and management of dry mouth conditions and non-dental chronic orofacial pain, such as burning mouth syndrome, trigeminal neuralgia and temporomandibular joint disorder, etc.